We stayed here for 3 days and thoroughly enjoyed the anchorage. The view from our stern looking out to all the beautiful buildings was spectacular at night. There was always something going on during the day such as scow training, seaplanes taking off and crewing. We ate at the Rusty Pelican a week later when we were staying somewhere else and the food and service was great. I wish they had their own dingy dock though as the marina did not allow us to bring our dingy in. People always ask us if there is a spacious, scenic, and safe anchorage in the heart of Miami. Marine Stadium is a huge manmade basin along Virginia Key, constructed in 1963 as the first stadium in the U.S. specifically for powerboat racing. Spectators viewed high-speed races, or sometimes floating concerts, from the 6,566-seat grandstand stadium, enjoying the backdrop of the Miami skyline. But you don’t have to worry about hydroplane races now. The last major race was held there in 1987 and the basin has become the perfect training venue for Olympic sailing and rowing teams. We enjoyed watching the men’s Canadian 49’er team showing off their stuff during our last visit. The grandstand was declared unsafe after Hurricane Andrew, and it has since become a bit of a three-dimensional canvas for colorful graffiti artists. But don’t let the urban art create the impression the anchorage is unsafe. 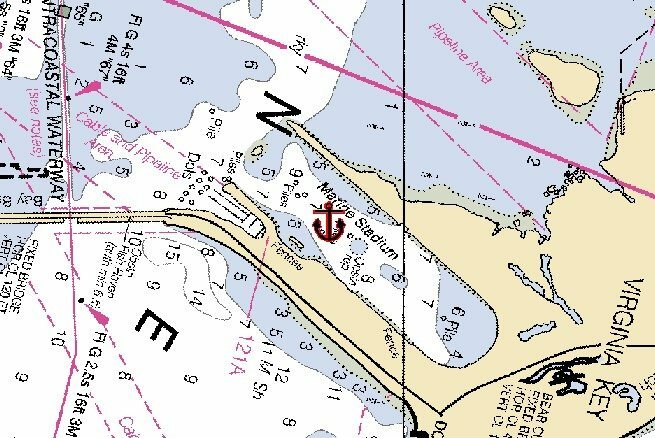 We have noticed regular patrols by the Miami marine police and the anchorage is consistently populated by local and transient vessels. The anchorage is surprisingly “scenic” — in a South Florida sort of way. The basin opens to the northwest, framing a perfect view of the day- or nighttime Miami skyline. The grandstand, along the southwest shore, is still an interesting historic structure. And the northeast shore is an undeveloped greenspace, with a small dock and sandy beach with casuarina trees where you can take Fido ashore. At the mouth of the basin you can dinghy to the Rusty Pelican restaurant near Rickenbacker Marina (which has an easy to hit fuel dock and a few moorings of its own). Personally we prefer the shelter (and price!) of Marine Stadium anchorage to the exposure of these out-of-the-basin moorings. Marine Stadium’s next metamorphosis may be to a full-fledged mooring field. The city has plans to populate the basin with guest moorings, but the project is currently on hold due to budget constraints. But no need to wait until the moorings are in to enjoy the history, scenery, and convenience of Marine Stadium anchorage.